Frying Machine BYZJ-IV - Hangzhou Expro Machinery Engineering Co.,Ltd. 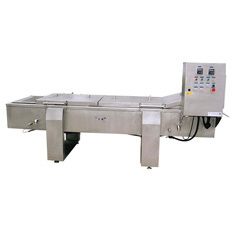 BYZJ-IV frying machine s used for frying chicken, fish, meatball, meat burger etc. This machine is equipped with stainless steel net conveyer, stepless speed regulation, automatic oil temperature control and a frying oil circulation-filtering system.